Last week, the world was given a sneak peek at up-and-coming tech for 2018 at the annual Consumer Electronics Show (CES) in Las Vegas. With the exception of the two hour power outage, the event was full of exciting new gadgets and features to make for one tech-filled year. Here are our favorites from this year’s CES. Image Courtesy of The Gadget Flow. Let’s face it – anything that makes traveling even the slightest bit easier can make a world of difference. Travelmate is set to hit the scene here in the US around February for $1,100 and is the answer to sore arms everywhere. 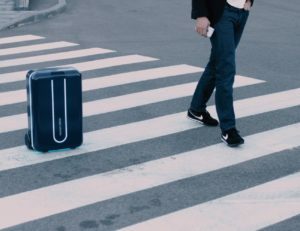 The self-driving luggage connects with a smartphone app and uses a special algorithm to steer a clear course of up to 11 kilometers per hour. Because rolling your own luggage around is so 2017. The roll-down projector screens we used to begrudgingly take notes off of in middle school have come a really, really long way. 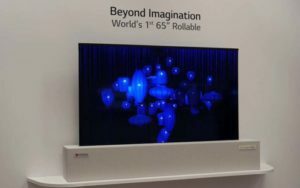 The glorious 65-in OLED screen from LG rolls upward, not unlike a tube of wrapping paper, to display an insanely bright and crisp image at a full 4K resolution. This is only a prototype, but certainly enough to show us where our TVs are headed in the near future. If your snooze button is getting a little worn out, it’s time to take a look at this ingenious LED Sleep Mask from Dreamlight. 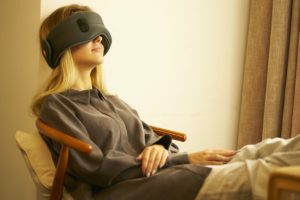 The tech behind this mask is engineered to help you get the best sleep possible, all thanks to the LED lights shown through small circuits in the foam placed over your eyes. The mask displays a 15 minute melatonin-inducing orange light show to lull you to sleep. Then, when it’s time to get going, it casts light green LEDs to gently wake you up. The mask is set to roll out on January 16, 2018. Image Courtesy of IEEE Spectrum. Are you the type of person that yearns for an animal companion but can barely care for a cactus? 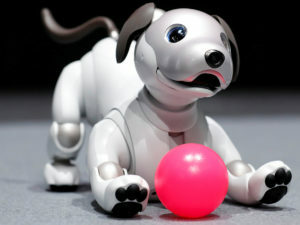 Aibo, or one of his many fellow robot pets introduced at CES, is the four-legged friend you’ve been waiting for. The new wonder dog from Sony can do more than just sit and lay down. It can dance, find a ball, and even use facial recognition through its camera to register the faces of your family members, all while developing its own personality overtime. It’s all of the fun with zero “accidents” in the house. What seems to have skipped the iPhone X is sure to be present in this year’s Vivo smartphone. An in-display fingerprint scanner is making its debut, which reveals a sensor placed right beneath the display screen to use your fingerprint to unlock the device. This is a feature that has been rumored to appear with the latest release of bezel-less devices, but the technology hadn’t been perfected until now. One of the bigger splashes made at this year’s CES was the Project Linda concept laptop from Razer. This docking station, made for the Razer smartphone, will act as a full-functioning laptop with a 13.3” touchscreen. Also included in the concept is a complete keyboard set with custom Android keys, eye-popping visuals and 200GB of internal storage. 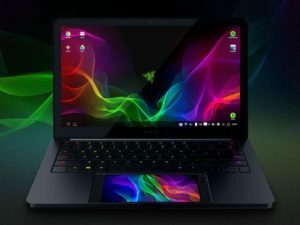 It’s a dual display laptop that powers off of the 5.3” Razer phone – quite the step up from that OG Razr that graced us in the early 2000’s. Are you dreaming of a new phone after CES? 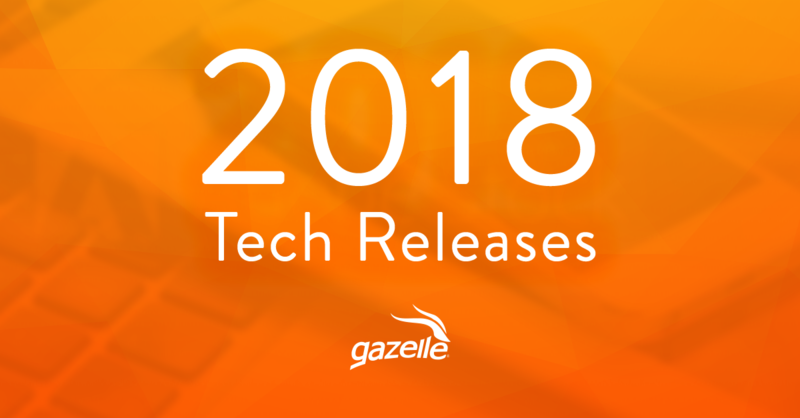 There’s no need to wait for the next big launch when you can get your hands on the hottest phones for less with Gazelle. We offer certified preowned devices like the iPhone X and Galaxy Note 8 that are ready to be shipped directly to your door. Check out our inventory of iPhone X and other phones here.